Libraries and librarians are committed to diversity as a foundational value. Diversity goes to the heart of who we are and what we do: a profession that serves everybody. IU Libraries commits to being self-critically aware – as individuals and an organization – of the world’s diversity and complexity, in order to be an open gateway and effective nexus for people and information. Download, print or review the Diversity Strategic Plan, offered by the IU Libraries' Diversity Committee. IU Libraries is a proud member of the Association of College & Research Libraries Diversity Alliance. The ACRL Diversity Alliance program unites academic libraries committed to increasing the hiring pipeline of qualified and talented individuals from underrepresented racial and ethnic groups. IU Libraries offers a carefully researched Diversity Resident position. Review and print the PDF. Can destroyed books still tell stories? The ARL statement shares alarming facts documenting an unquestionable increase in antisemitic acts on college campuses in recent years and asks the higher education community to redouble its efforts to foster inclusive dialog. At this same time, librarians at Indiana University were looking back to fall 2010 when a series of antisemitic events took place on the Bloomington campus, one of them involving the intentional destruction of eight books from the Jewish Studies Collection held at Herman B Wells library. Noting the symbolic passage of time, members of the IU Libraries’ Diversity Committee are working with colleagues to mark the passing of eight years by reclaiming the content of the eight destroyed titles for Indiana University researchers. The discovery efforts conducted over time have produced very few direct replacements. In fact, of the eight titles, only one physical copy has been found, although it is hoped some form of digital access will soon be established for all. In the committee’s visible work to document and reclaim the missing titles, many IU Libraries collection managers were inspired to make related symbolic purchases in their own areas of study. 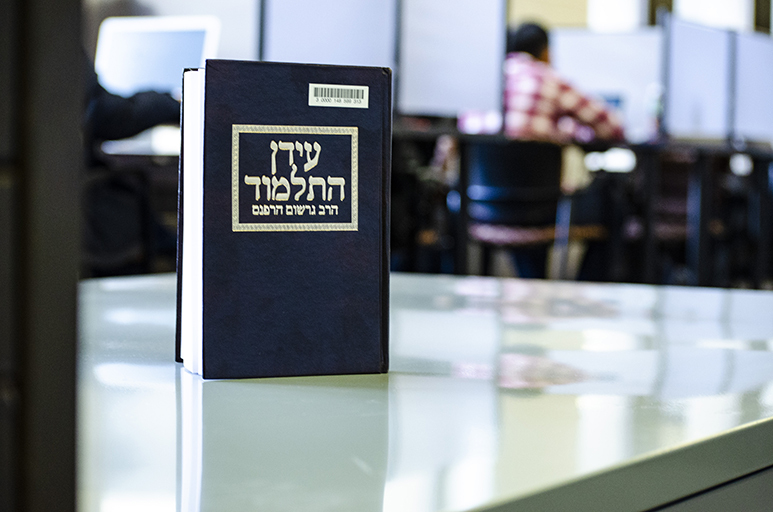 Sefer Diḳduḳe sofrim : kolel nusḥaʼot ṿe-girsaʼot ha-nimtsaʼot be-Talmud ketav yad mi-shenat 103 la-elef ha-shishi ha-munaḥ be-ʻir Minkhen, : ʻim hagahot Divre sofrim : kolel nusḥaʼot shonot mi-kitve yad nosafim umi-defusim ḳedumim ule-varer et ha-nusḥa ha-yesharah ʻa. pi divre ha-rishonim zal ṿe-ʻa. pi shiḳul ha-daʻat ... / me-et Refaʼel Natan Netaʻ Rabinoṿiṭts. Sefer Liḳuṭ rishonim : ʻal masekhet Bava kamma / ṿe-hu liḳuṭ mi-teshuvot rabotenu ha-rishonim, Rif ... [et al. ], u-mesudarim daf ʻal daf. Perush Rabenu Ḥananʼel : Masekhet Bava ḳama / le-Rabenu Ḥananʼel b.R. Ḥushiʼel ; yo. l. ʻal-pi ketav-yad u-defusim rishonim be-tseruf mavo, tsiyune meḳorot, maḳbilot, heʻarot u-veʼurim me-et Tsevi Yehoshuʻa Laiṭner ; be-tosefet ḥidushim u-veʼurim me-et Dov Domb. פירוש רבינו חננאל : מסכת בבא קמא / לרבינו חננאל ב״ר חושיאל ; יו״ל על־פי כתבי־יד ודפוסים ראשונים בצירוף מבוא, ציוני מקורות, מקבילות, הערות וביאורים מאת צבי יהושע לייטנר ; בתוספת חידושים וביאורים מאת דוב דומב. Sefer Ḥidushe Mahariʾa : ʻal Pirḳe Avot / Yehudah Asod ; asafti ṿe-liḳaṭeti Yiśraʾel Brunner. ספר חידושי מהרי״א : על פרקי אבות / יהודה אסאד ; אספתי ולקטתי ישראל ברוננער. Sefer ʻErekh kesef : ʻinyanim be-maʻarakhot ... / ḥibro Ḥayim Shemuʾel Gaṭinyo. ʻIdan ha-Talmud : seḳirah hisṭorit ʻal teḳufot anshe keneset ha-gedolah, ha-Tanaʾim, ha-Amoraʾim, ha-Savoraʾim ṿeha-Geʾonim be-Erets-Yiśraʾel uve-Vavel : mi-yemot ʻEzra ha-sofer ʻad ḥurban ha-arets bi-yede ha-Tsalvanim / Gershom Harpanas. Talmud Yerushalmi (1967), vol. 3-4. Can open access publishing offer a new environment of inclusion? IN TRADITIONAL ACADEMIC PUBLISHING, A PERSISTENT LACK OF DIVERSITY IN AUTHORSHIP IS WELL DOCUMENTED AND DISCUSSED. Dismantling barriers to information access is central to the mission of the academic library. The rising cost of journal subscriptions puts research access at risk. At IU Libraries, we have been working on solutions to this problem for over a decade. One of the most prolific is our open scholarship services—facilitating IU-authored, scholarly work on the open web for anyone to read. Today, IU ScholarWorks, developed and deployed by the Scholarly Communication department of IU Libraries, delivers 49 Open Access journals and serves as the repository for more than 8,000 deposited items. In traditional academic publishing, a persistent lack of diversity in authorship is well documented and discussed. That led Scholarly Communication leaders to ask: What happens when research is liberated and cost barriers removed? Can open access publishing offer a new environment of inclusion? As the new Open Scholarship Resident, Willa Liburd Tavernier (pictured above in a team meeting) intends to find out. Charged with assessment and outreach of the current ScholarWorks inventory, Liburd Tavernier believes the two go hand in hand. “We don’t have information right now in terms of a profile of whom is left out. Once I do the assessment, then my outreach becomes very targeted to encouraging those gaps to be filled,” she explained. 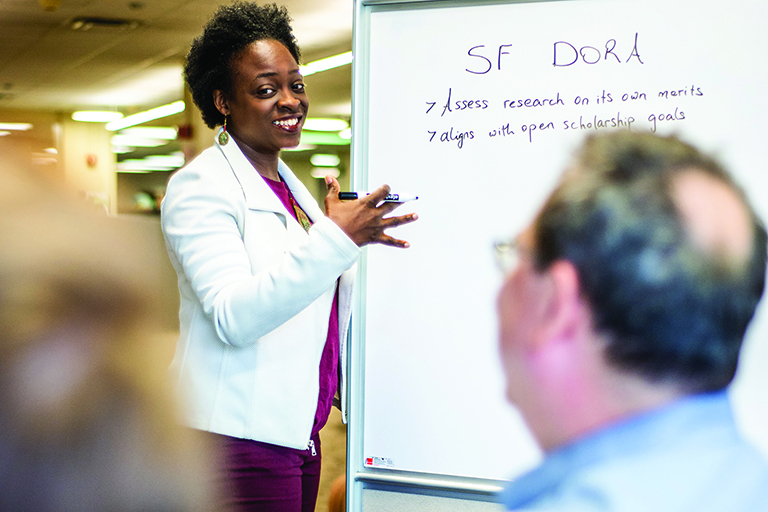 Library leaders participating in the Association of College and Research Libraries (ACRL) Diversity Alliance are committed to opening doors, sharing their networks, and preparing residents for success. As part of its diversity plan implementation, IU Libraries joined the Alliance in 2017 and in 2018 recruited Liburd Tavernier with a highly strategic, well-defined resident position.